A group of University of Wisconsin-Madison engineers and a collaborator from China have developed a nanogenerator that harvests energy from a car's rolling tire friction. An innovative method of reusing energy, the nanogenerator ultimately could provide automobile manufacturers a new way to squeeze greater efficiency out of their vehicles. The researchers reported their development, which is the first of its kind, in a paper published May 6, 2015, in the journal Nano Energy. Xudong Wang, the Harvey D. Spangler fellow and an associate professor of materials science and engineering at UW-Madison, and his PhD student Yanchao Mao have been working on this device for about a year. The nanogenerator relies on the triboelectric effect to harness energy from the changing electric potential between the pavement and a vehicle's wheels. The triboelectric effect is the electric charge that results from the contact or rubbing together of two dissimilar objects. Wang says the nanogenerator provides an excellent way to take advantage of energy that is usually lost due to friction. "The friction between the tire and the ground consumes about 10 percent of a vehicle's fuel," he says. "That energy is wasted. So if we can convert that energy, it could give us very good improvement in fuel efficiency." The nanogenerator relies on an electrode integrated into a segment of the tire. When this part of the tire surface comes into contact with the ground, the friction between those two surfaces ultimately produces an electrical charge-a type of contact electrification known as the triboelectric effect. 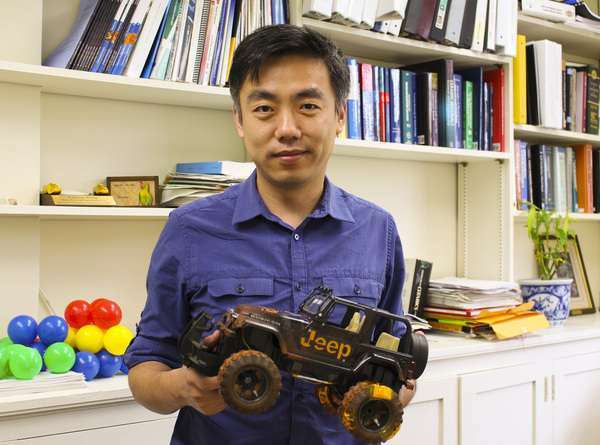 Wang and his colleagues used a toy car during initial trials. Credit: College of Engineering. 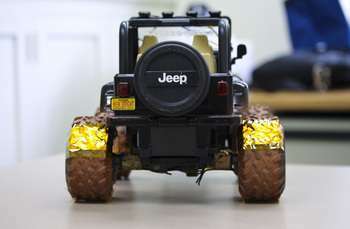 During initial trials, Wang and his colleagues used a toy car with LED lights to demonstrate the concept. They attached an electrode to the wheels of the car, and as it rolled across the ground, the LED lights flashed on and off. The movement of electrons caused by friction was able to generate enough energy to power the lights, supporting the idea that energy lost to friction can actually be collected and reused. "Regardless of the energy being wasted, we can reclaim it, and this makes things more efficient," Wang says. "I think that's the most exciting part of this, and is something I'm always looking for: how to save the energy from consumption." The researchers also determined that the amount of energy harnessed is directly related to the weight of a car, as well as its speed. Therefore the amount of energy saved can vary depending on the vehicle-but Wang estimates about a 10-percent increase in the average vehicle's gas mileage given 50-percent friction energy conversion efficiency. "There's big potential with this type of energy," Wang says. "I think the impact could be huge." I would think this "load" the tires so that the harvested energy would be offset by additional energy needed to push the vehicle. I can see tires getting extremely expensive if this was implemented. Would this reduce the heat in the tires some way?